MartinLogan’s Subwoofer Control app uses a Bluetooth connection to simplify setup and configuration of Dynamo 800X. App based controls include volume level, low–pass filter (frequency and order), phase, 20–30Hz level, three preset listening modes, and control of Anthem Room Correction. A unique tone sweep feature assists users in locating areas in listening rooms where troublesome rattles or resonances may occur. A single press of a button allows listeners to initiate a tone sweep from 20–120Hz. If a rattle or resonance occurs in the room any frequency can be held, allowing the listener to investigate and identify the source of the unwanted noise. In the lab, MartinLogan engineers strive for transparency. Outside the lab, there’s one wildcard our engineers can never account for—the listening room. The unique size and shape of a listening space (and its contents) can make bass waves do unpredictable things, greatly affecting a subwoofer’s overall performance. Anthem Room Correction measures low–frequency sound output in a room and compares it to optimal response curves that account for spatial anomalies. The advanced algorithms of Anthem Room Correction effectively remove anomalies, leaving only the ideal standard— realistically blended, natural–sounding bass. Dynamo 800X utilize a Bluetooth connection with a smartphone or USB connection with a PC to run Anthem Room Correction. Although correct placement plays a key role in optimizing subwoofer performance, sometimes it imposes the inconvenience of running long lengths of cable through walls, along baseboards or under floors and carpets. To solve the problem, Dynamo 800X includes a connection port for an optional wireless system. 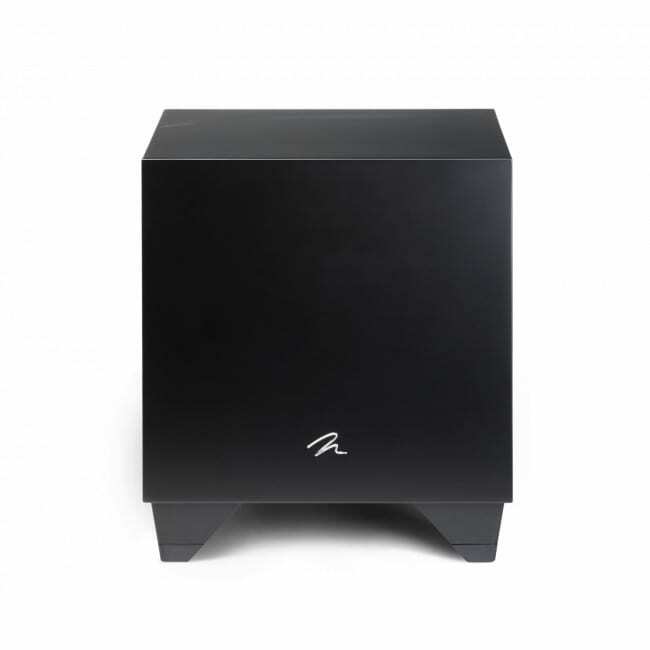 MartinLogan’s new SWT–X Wireless Subwoofer System (sold separately) incorporates the latest in wireless audio transmission technology, including 2.4GHz dynamic frequency selection, forward error correction, and a range up to 50 feet. Easy to install in the subwoofer, the SWT–X receiver requires no external power source or audio connections. Dynamo 800X subwoofers feature left and right input via RCA line level as well as speaker level connections. 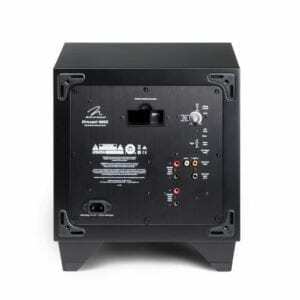 Dynamo 800X ups the ante by adding a discrete LFE RCA line level input. 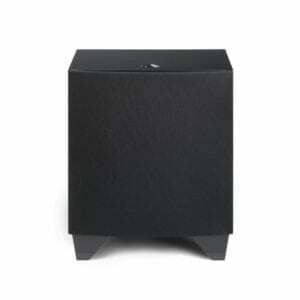 Dynamo 800X subwoofers features left and right input via robust connection and a control system that allows simultaneous connection of both 2–channel stereo music and multi–channel home theater and allows each source to have individual crossover and level settings, giving listeners a perfect performance in every application. LFE inputs use no low–pass filter, leaving crossover control to the processor. Left and right inputs integrate discrete user–adjustable low–pass filters allowing different level and crossover points when playing back two channel music. The latest generation of MartinLogan Dynamo subwoofers feature advanced–design woofers with inverted surrounds and powerful magnet, motor, and suspension designs. In front–fire mode the unique inverted surround design maximizes excursion clearance behind the grill cover. When positioned in a down–firing configuration, the inverted surround significantly reduces airflow related turbulence for an articulate and detailed low–frequency experience. These advanced–technology woofers pair a high–power magnet structure (significantly more robust than previous generations) with low–mass diaphragms to provide massive excursions while perfectly preserving the tiniest bass detail. The exceptional damping properties of the cone ensure a smooth, non–resonant response necessary for truly seamless blending with high–performance loudspeakers. Every element of Dynamo subwoofers has been meticulously designed to deliver a staggering low–frequency performance – all without a hint of distortion. Dynamo subwoofer class–D amplifiers operate with extremely low levels of distortion and deliver dynamic impact with plenty of overhead. Low– noise, high–power switching power supplies produce clean power efficiently in a small space and effortlessly provide tremendous levels of current. Both feature high–quality MOSFET transistors, transformers, noise–suppression networks, and control circuitry. 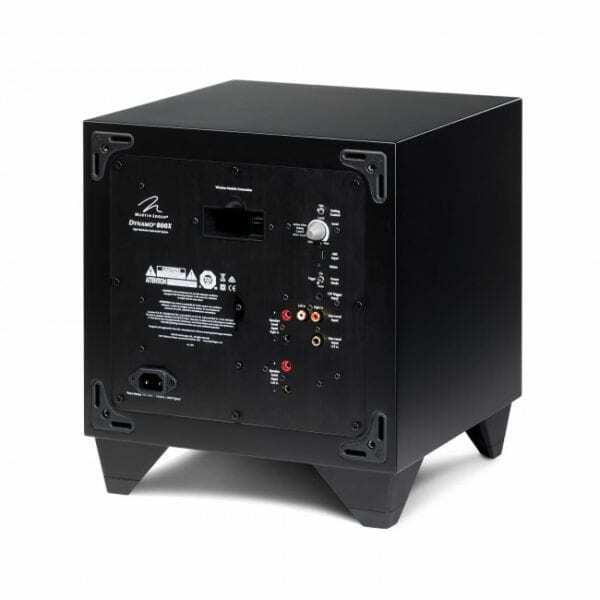 The switching power supply combined with reliable class–D technology means there’s virtually no energy lost in the subwoofer system. 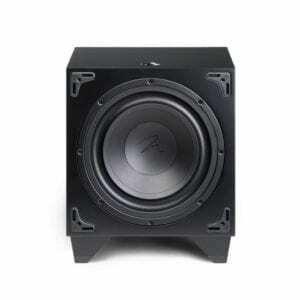 The IME filter used in the Dynamo subwoofers is derived from the inverse of the unfiltered driver response. Precision IME filtering yields extremely accurate low–frequency response—superior to that provided by the simple second–order high–Q filters typically found in subwoofers in this price range. Although ports, when correctly designed, are a convenient and cost–effective way of increasing low–frequency output, when used in small cabinets their reliance on resonant energy can impair bass quality. 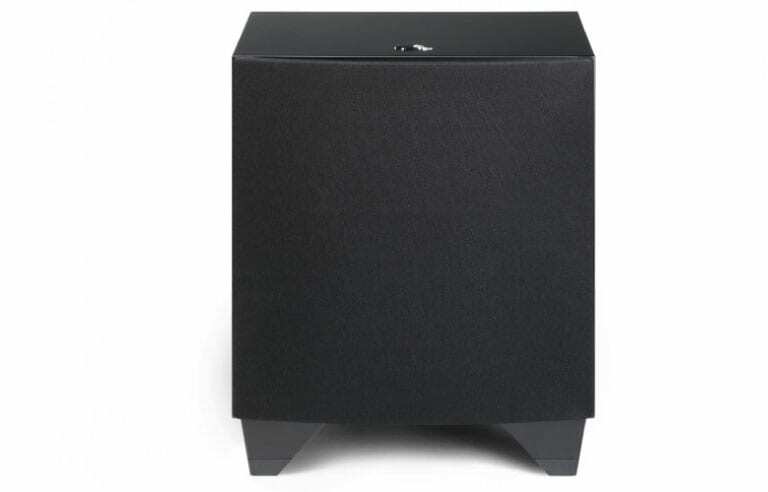 Dynamo 800X are compact, sealed subwoofer systems that minimize transient–blurring group delay while maintaining smooth, consistent response, regardless of music or movie source material. The cabinets are constructed from the finest composite material for acoustic integrity. 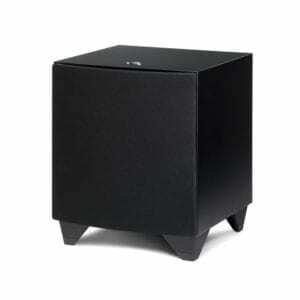 Inside, critically placed structural cross–bracing provides a stable foundation for the woofer, while the added rigidity keeps cabinet–induced resonances and non–linearities to inaudible levels. Dynamo 800X come with custom ETC spikes which can be used to enhance stability on thick carpets, or create tighter coupling between subwoofer and floor to enhance overall sound quality. The built–in spikes are conveniently and discretely hidden underneath the rubber feet.